Revised: March 21, 2011 Click anywhere on the screen to advance. 2 Revised: March 21, 2011 Click anywhere on the screen to advance. 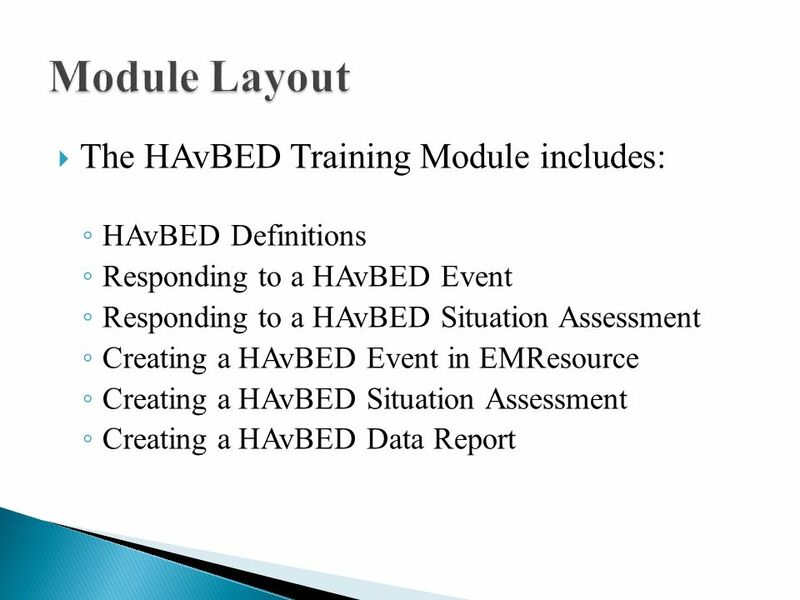 7  “HAvBED” stands for Hospital Available Beds for Emergencies and Disasters. 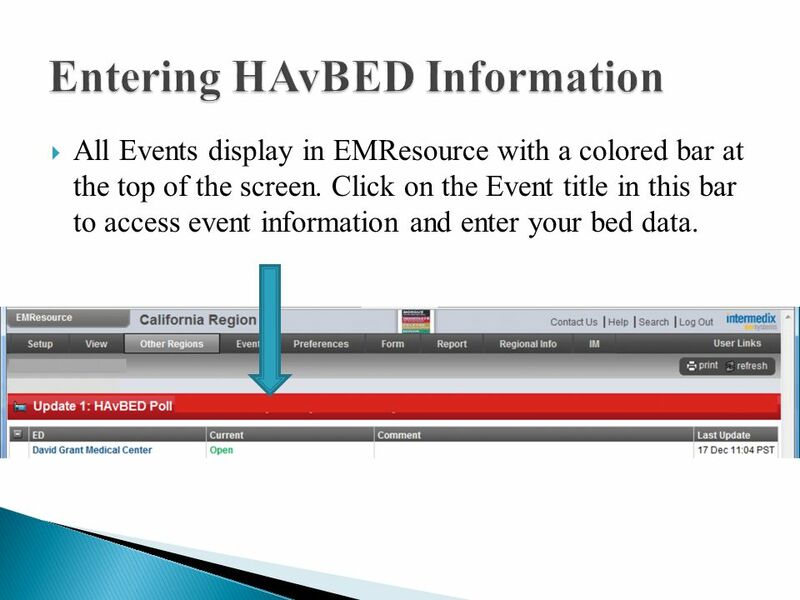  The HAvBED system was developed by the U.S. Department of Health and Human Services to rapidly assess hospital inpatient bed availability throughout the country. 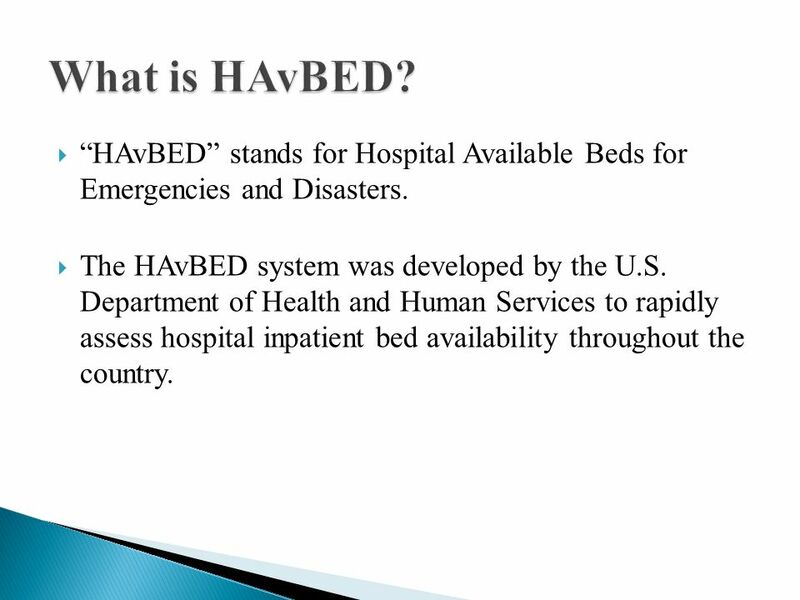 8  Licensed Beds: This refers to the maximum number of beds for which a hospital holds a license to operate. 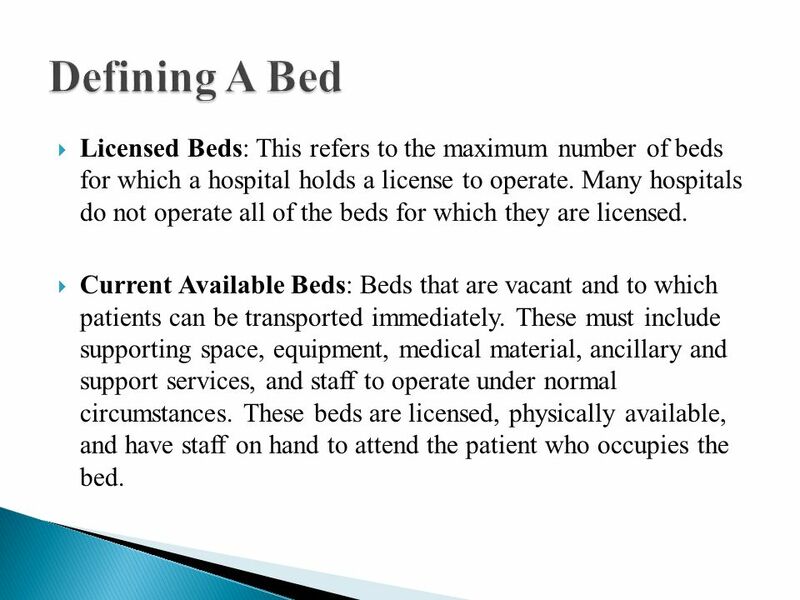 Many hospitals do not operate all of the beds for which they are licensed. 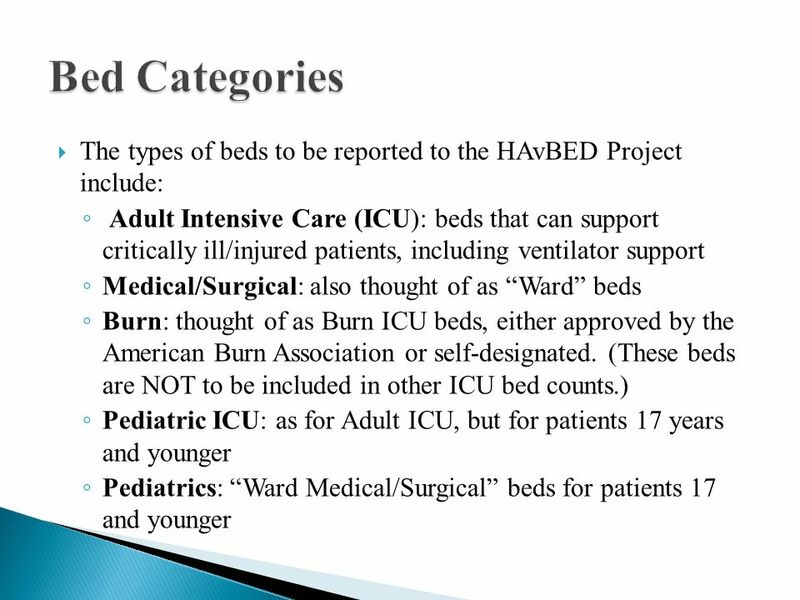  Current Available Beds: Beds that are vacant and to which patients can be transported immediately. These must include supporting space, equipment, medical material, ancillary and support services, and staff to operate under normal circumstances. 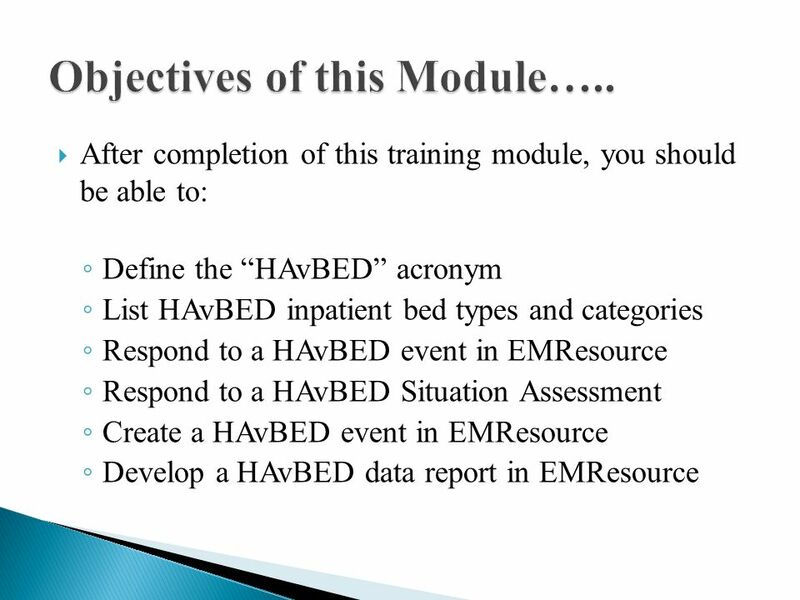 These beds are licensed, physically available, and have staff on hand to attend the patient who occupies the bed. 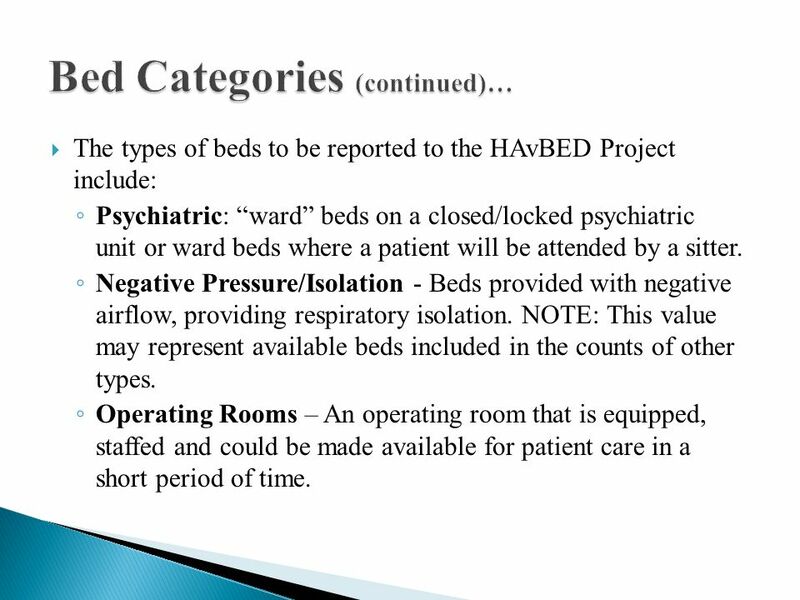 10  The types of beds to be reported to the HAvBED Project include: ◦ Psychiatric: “ward” beds on a closed/locked psychiatric unit or ward beds where a patient will be attended by a sitter. 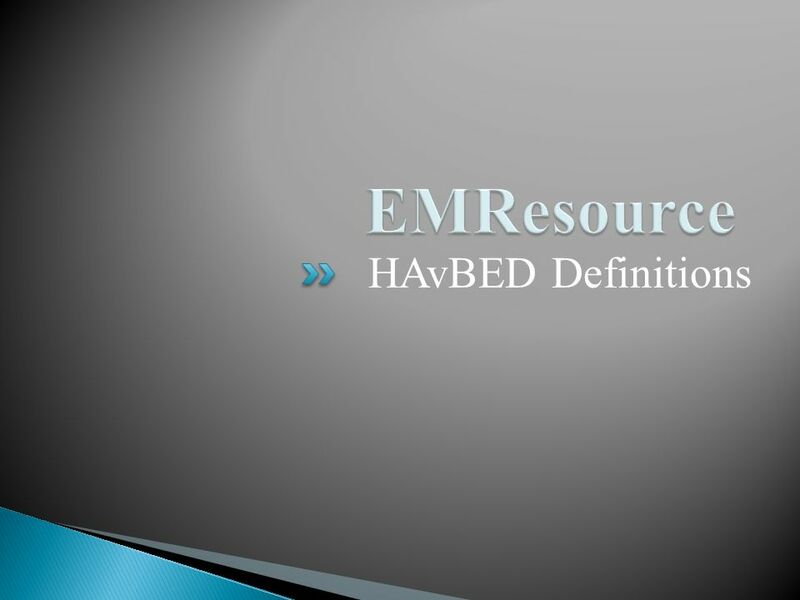 ◦ Negative Pressure/Isolation - Beds provided with negative airflow, providing respiratory isolation. NOTE: This value may represent available beds included in the counts of other types. ◦ Operating Rooms – An operating room that is equipped, staffed and could be made available for patient care in a short period of time. 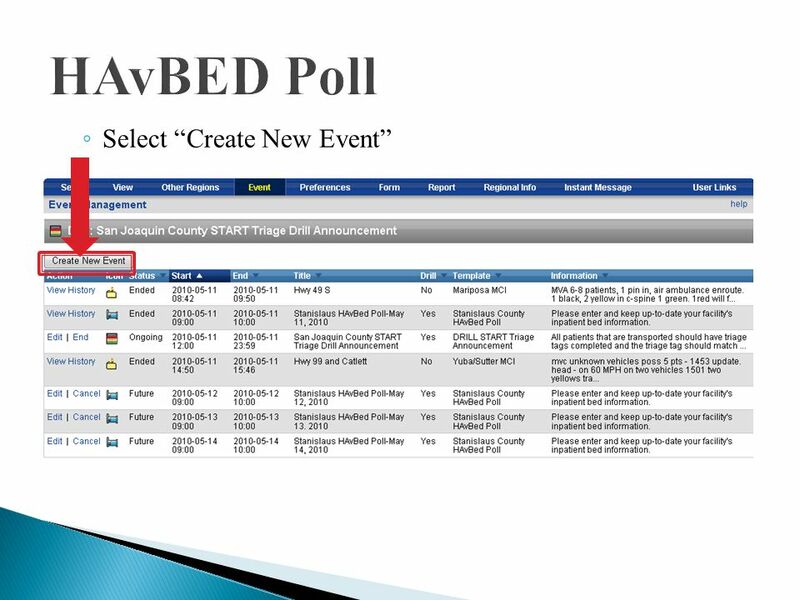 11  This value will represent an informed estimate as to how many vacant (staffed, unoccupied) beds for each bed type above the current number that could be made available within 24 hours. 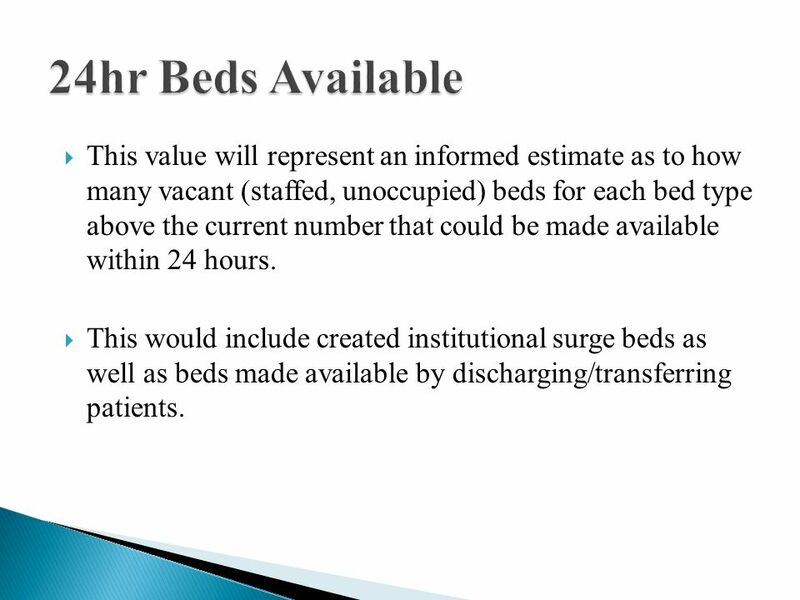  This would include created institutional surge beds as well as beds made available by discharging/transferring patients. 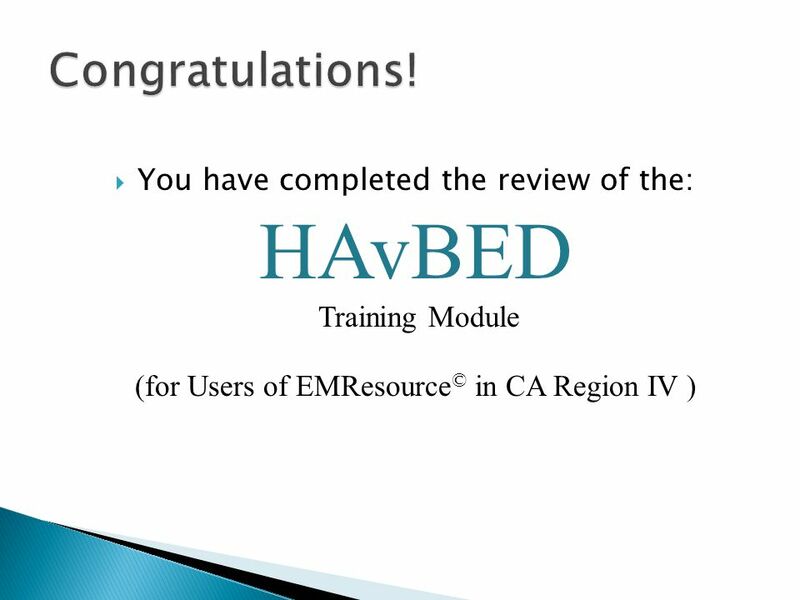 12  This value will represent an informed estimate as to how many vacant (staffed, unoccupied) beds for each bed type above the current number that could be made available within 72 hours. 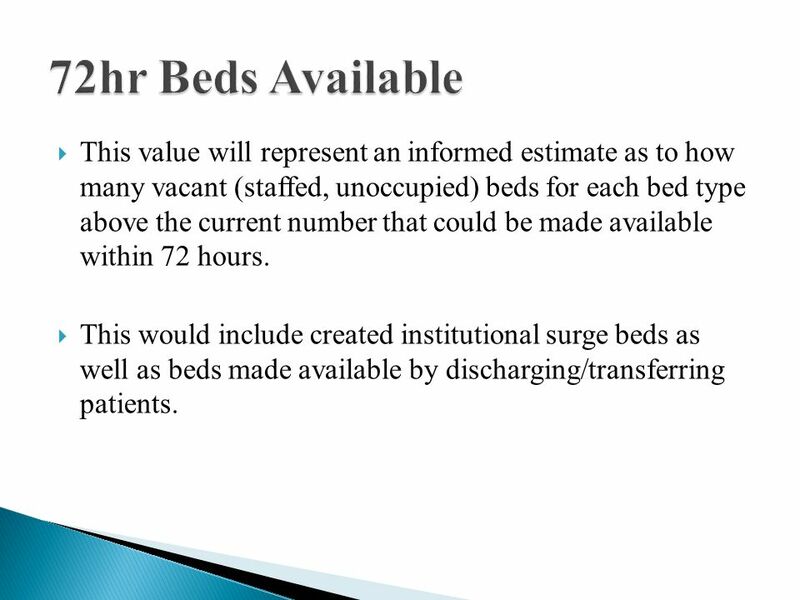  This would include created institutional surge beds as well as beds made available by discharging/transferring patients. 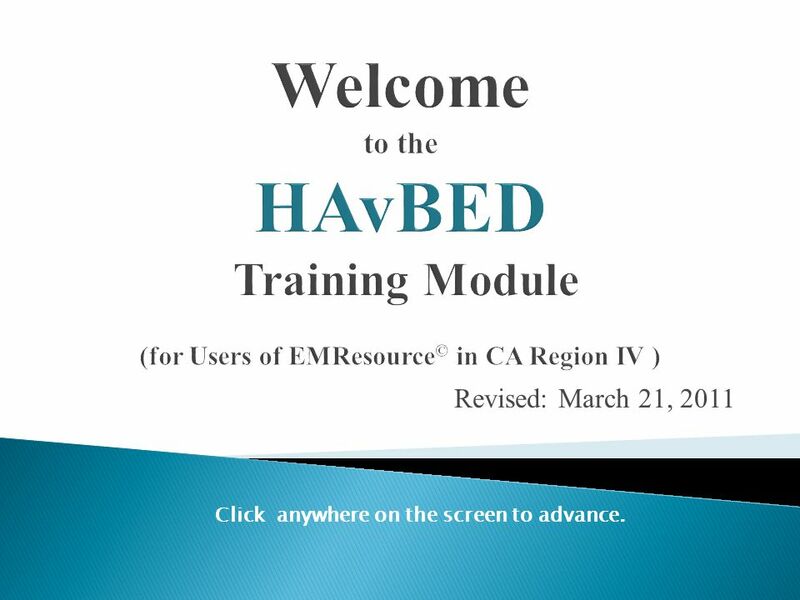 14  Available – The institution has chemical/biological/radiological multiple patient decontamination capability. 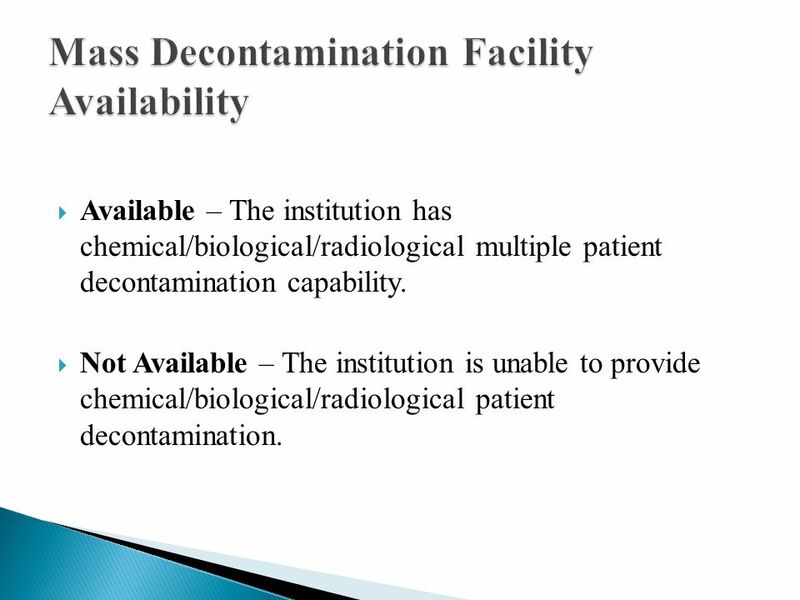  Not Available – The institution is unable to provide chemical/biological/radiological patient decontamination. 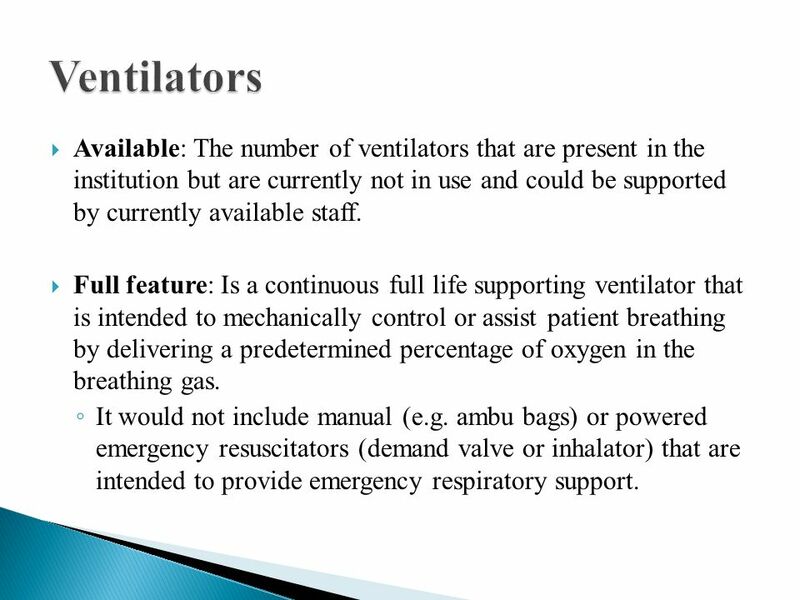 15  Available: The number of ventilators that are present in the institution but are currently not in use and could be supported by currently available staff. 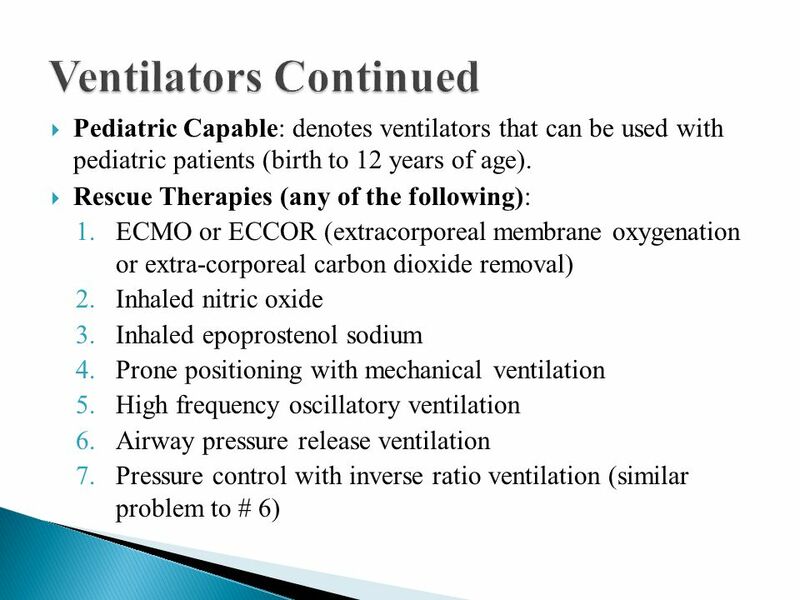  Full feature: Is a continuous full life supporting ventilator that is intended to mechanically control or assist patient breathing by delivering a predetermined percentage of oxygen in the breathing gas. ◦ It would not include manual (e.g. ambu bags) or powered emergency resuscitators (demand valve or inhalator) that are intended to provide emergency respiratory support. 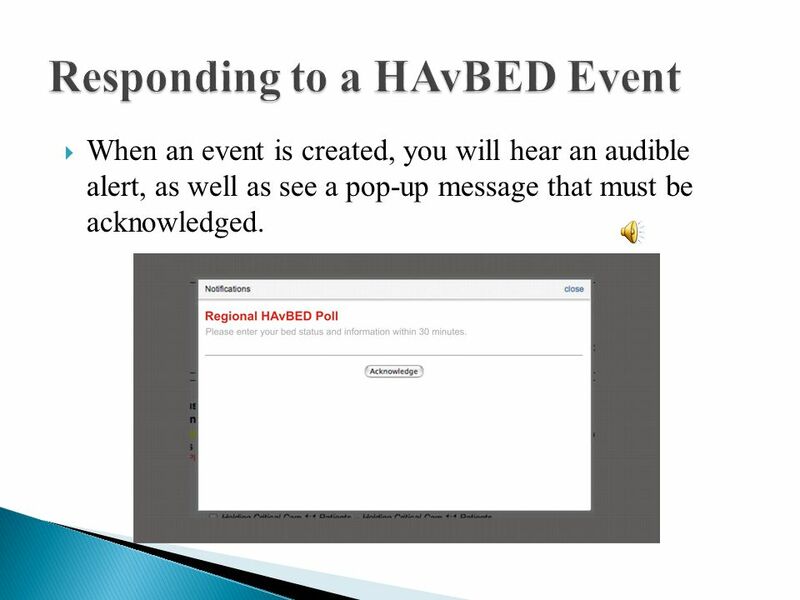 18  When an event is created, you will hear an audible alert, as well as see a pop-up message that must be acknowledged. 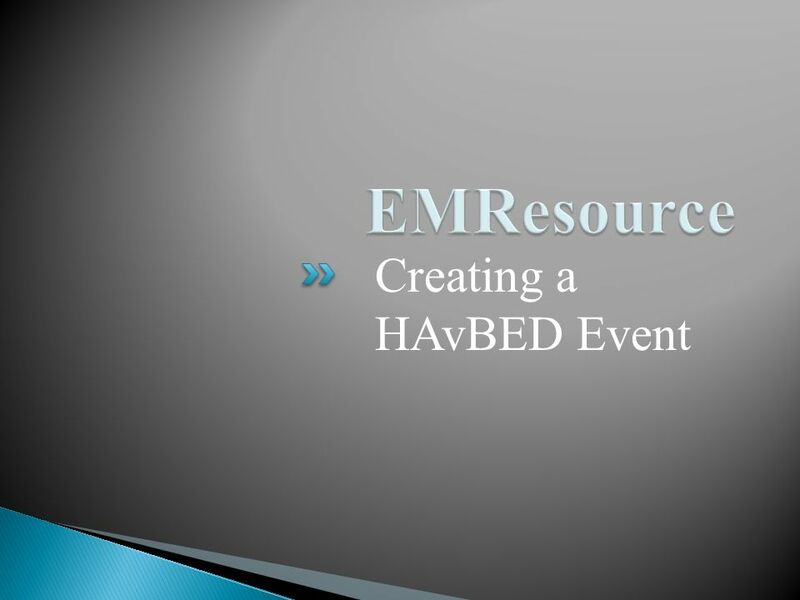 19  All Events display in EMResource with a colored bar at the top of the screen. 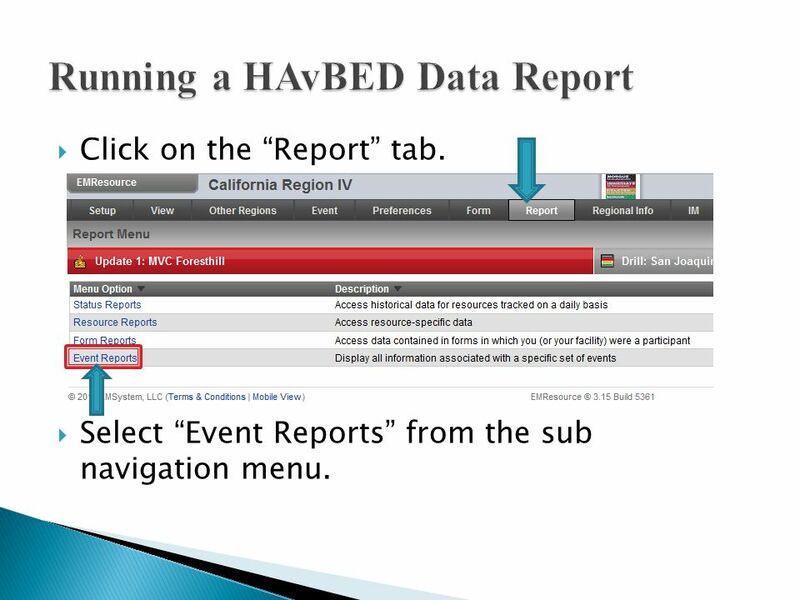 Click on the Event title in this bar to access event information and enter your bed data. 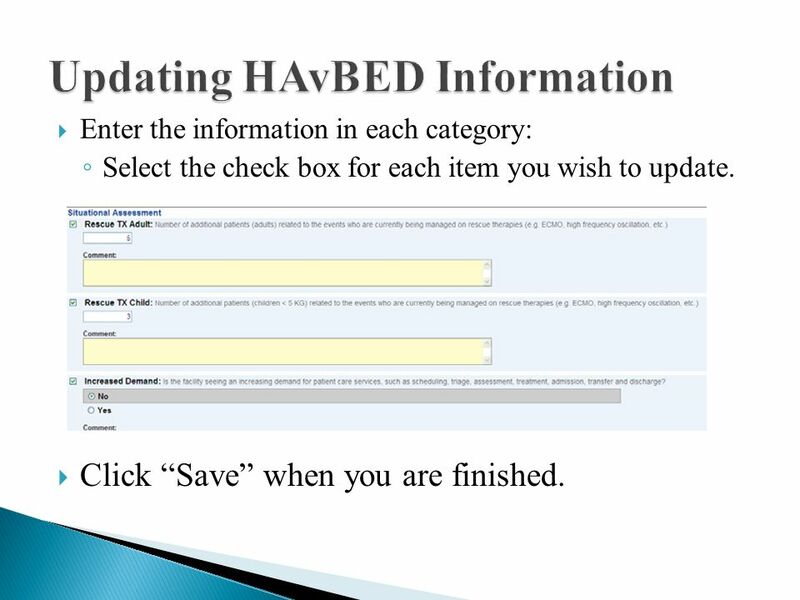 21  Enter the information in each category: ◦ Select the check box for each item you wish to update.  Click “Save” when you are finished. 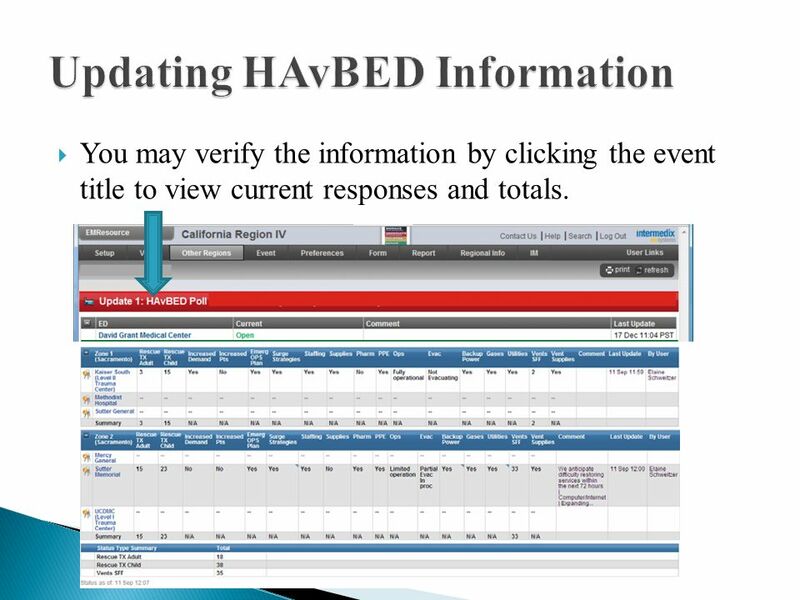 22  You may verify the information by clicking the event title to view current responses and totals. 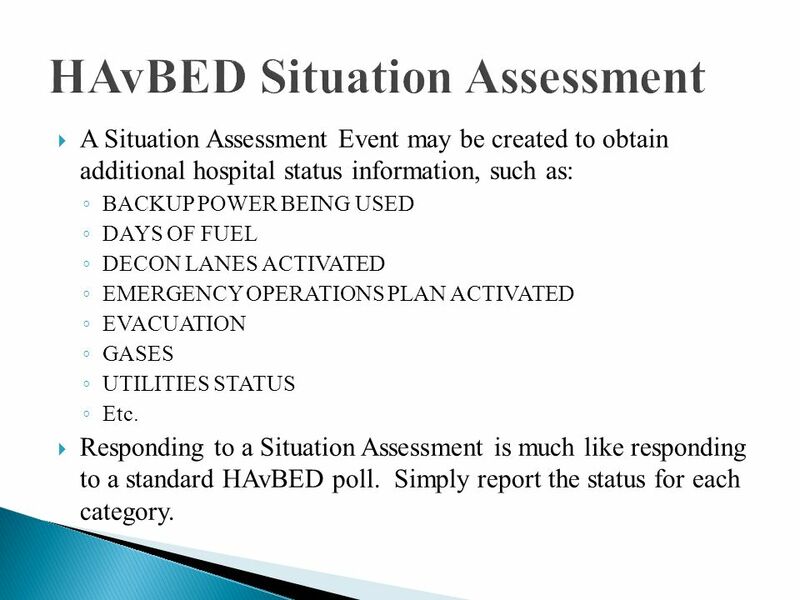 24  A Situation Assessment Event may be created to obtain additional hospital status information, such as: ◦ BACKUP POWER BEING USED ◦ DAYS OF FUEL ◦ DECON LANES ACTIVATED ◦ EMERGENCY OPERATIONS PLAN ACTIVATED ◦ EVACUATION ◦ GASES ◦ UTILITIES STATUS ◦ Etc. 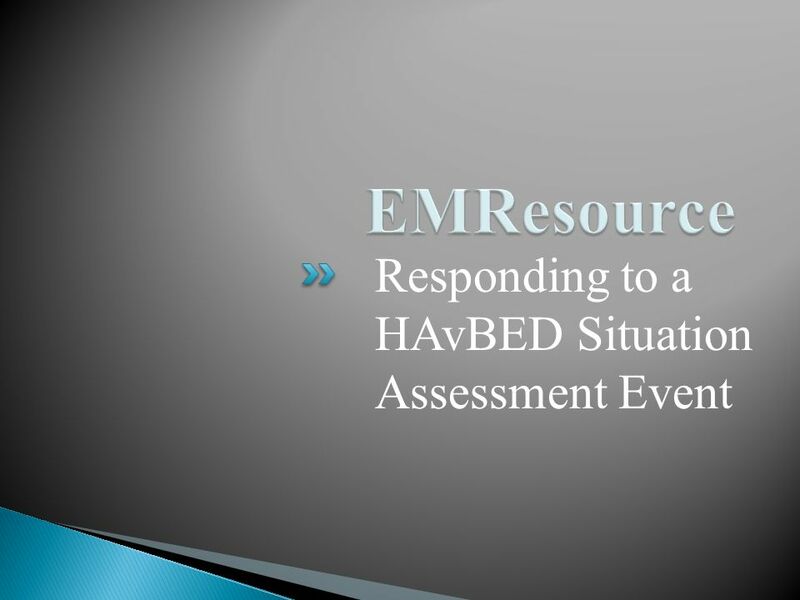  Responding to a Situation Assessment is much like responding to a standard HAvBED poll. 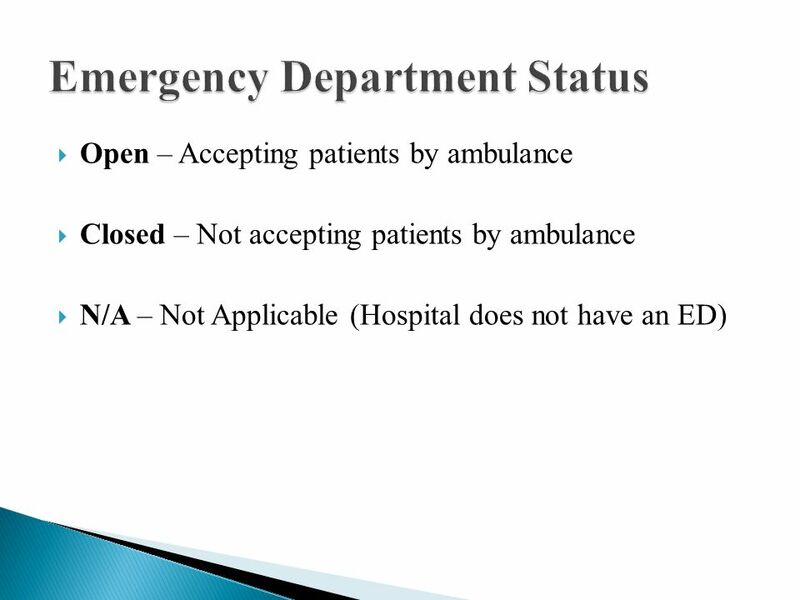 Simply report the status for each category. 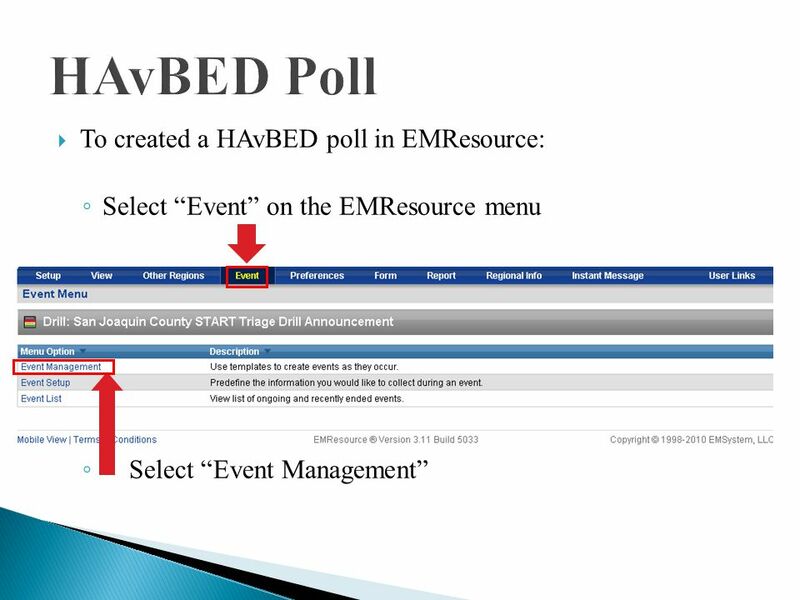 26  Only facilities and individuals authorized to create a HAvBED poll will see this option on their EMResource menu. 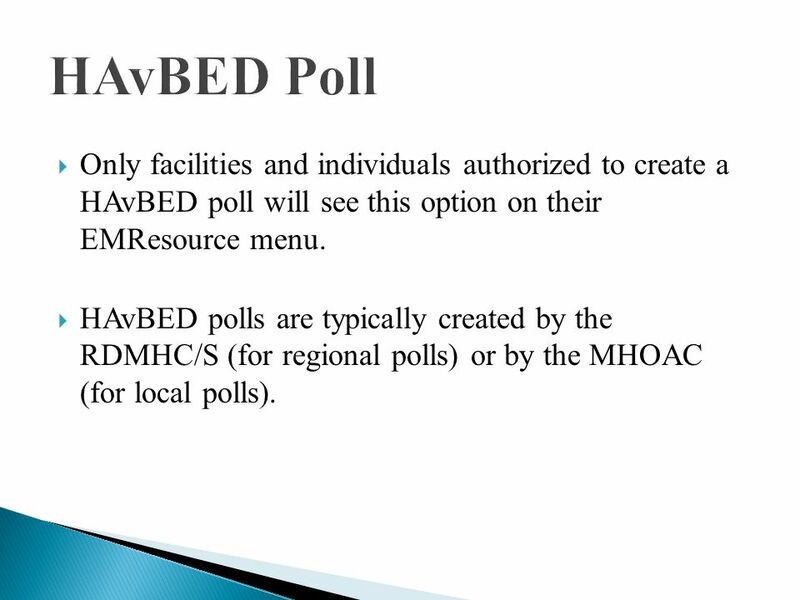  HAvBED polls are typically created by the RDMHC/S (for regional polls) or by the MHOAC (for local polls). 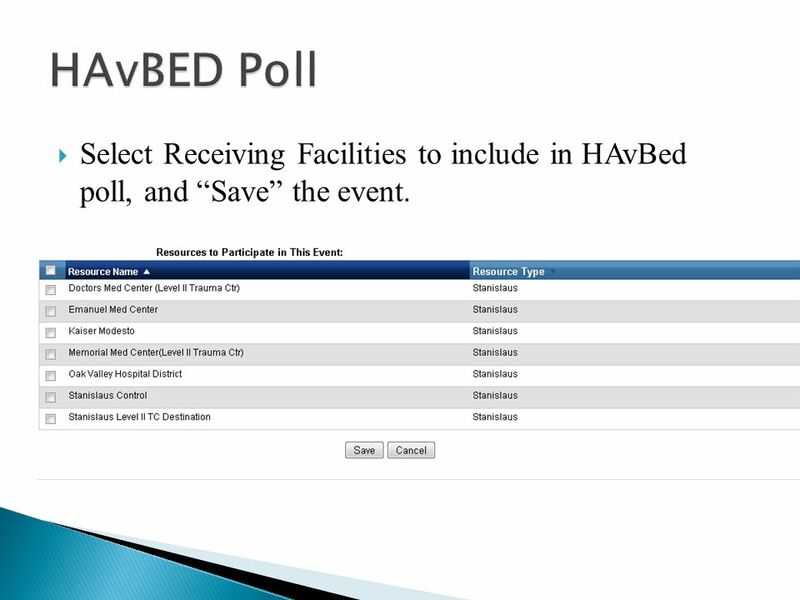 31  Select Receiving Facilities to include in HAvBed poll, and “Save” the event. 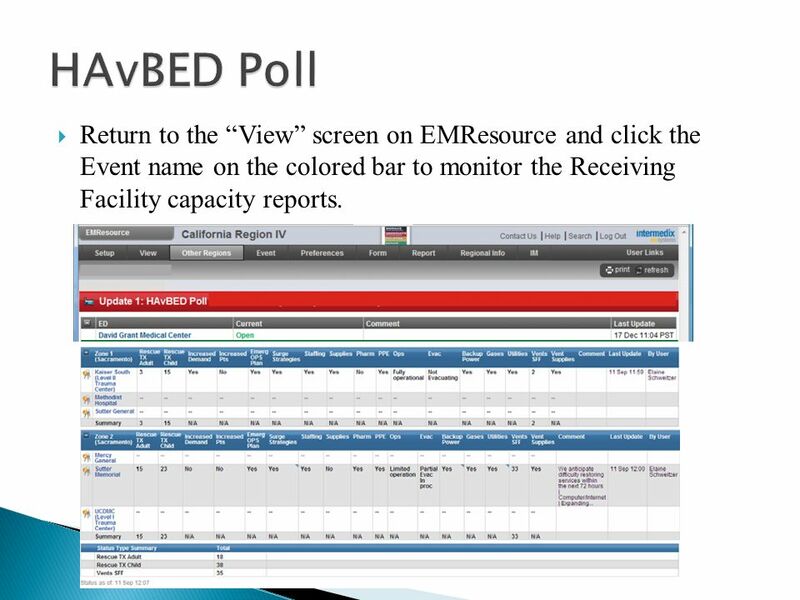 32  Return to the “View” screen on EMResource and click the Event name on the colored bar to monitor the Receiving Facility capacity reports. 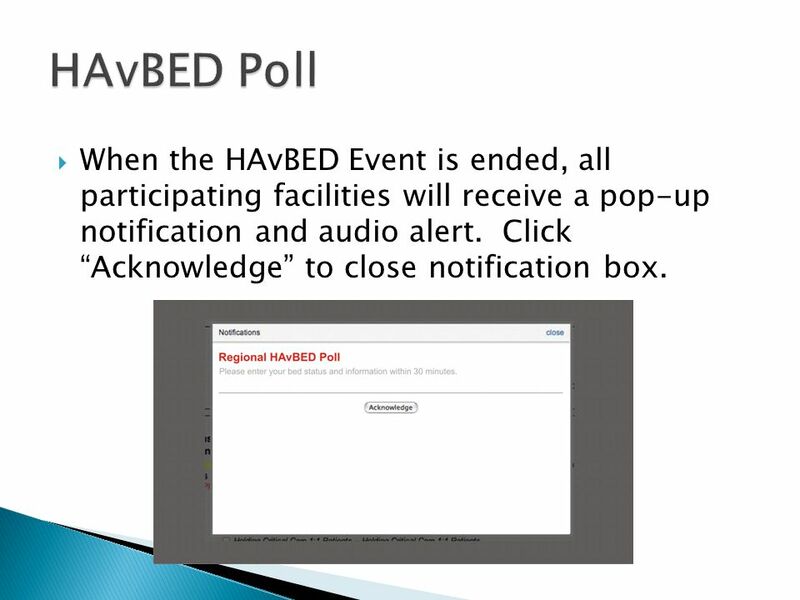 33  When the HAvBED Event is ended, all participating facilities will receive a pop-up notification and audio alert. Click “Acknowledge” to close notification box. 35  Click on the “Report” tab. 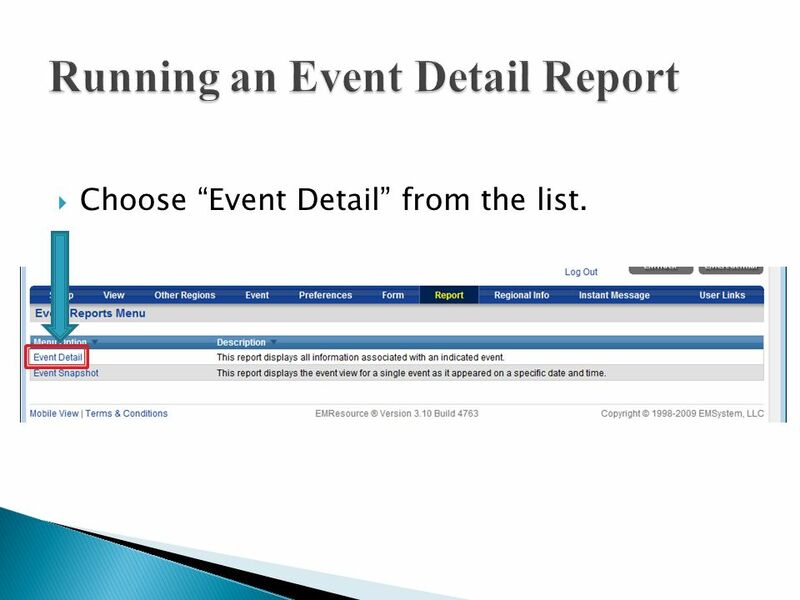  Select “Event Reports” from the sub navigation menu. 36  Choose “Event Detail” from the list. 37  A new screen will be opened. 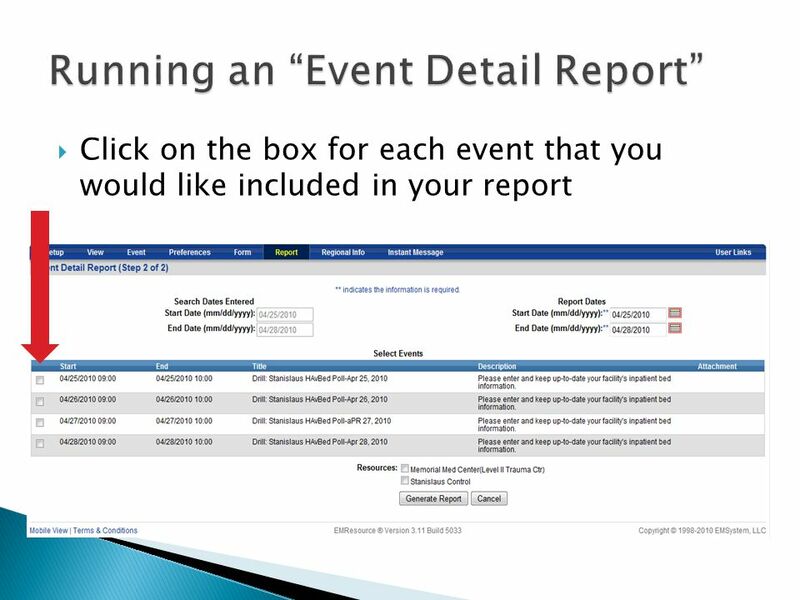  Enter the beginning and ending dates to search for the Event, using the correct format (mm/dd/yyyy). 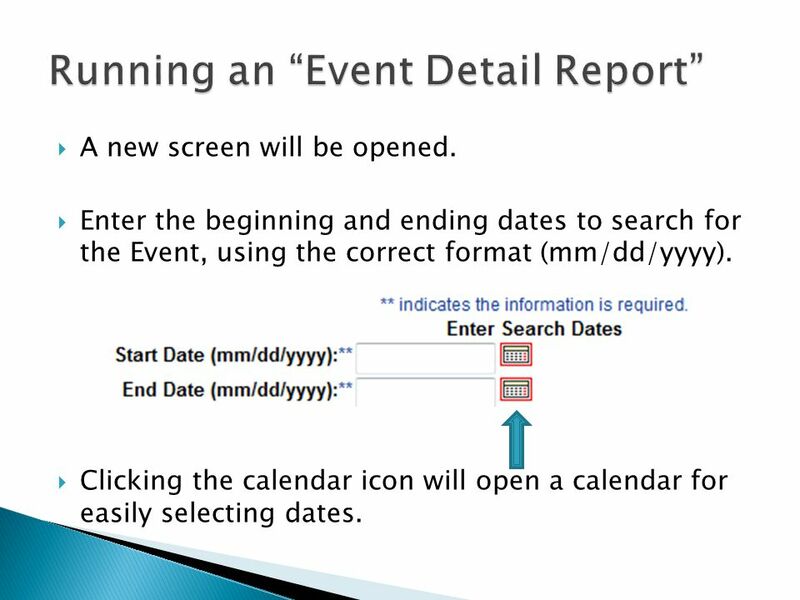  Clicking the calendar icon will open a calendar for easily selecting dates. 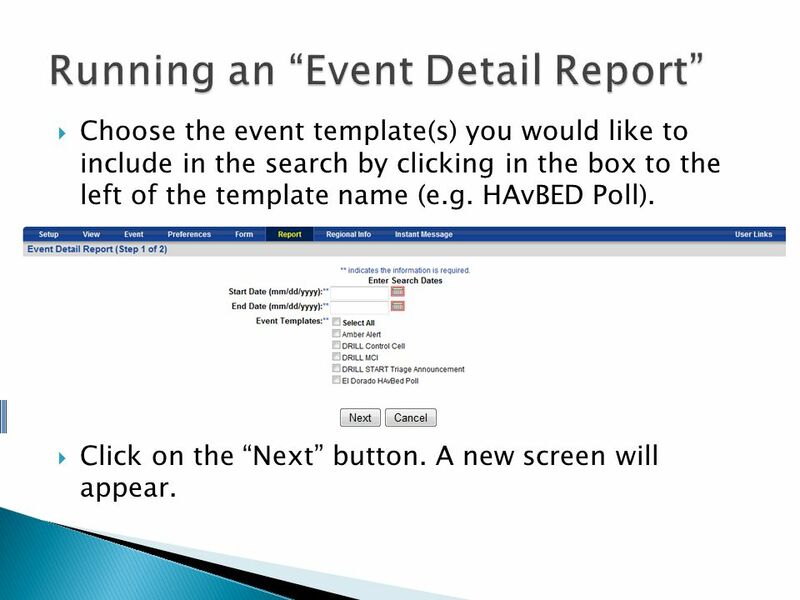 38  Choose the event template(s) you would like to include in the search by clicking in the box to the left of the template name (e.g. 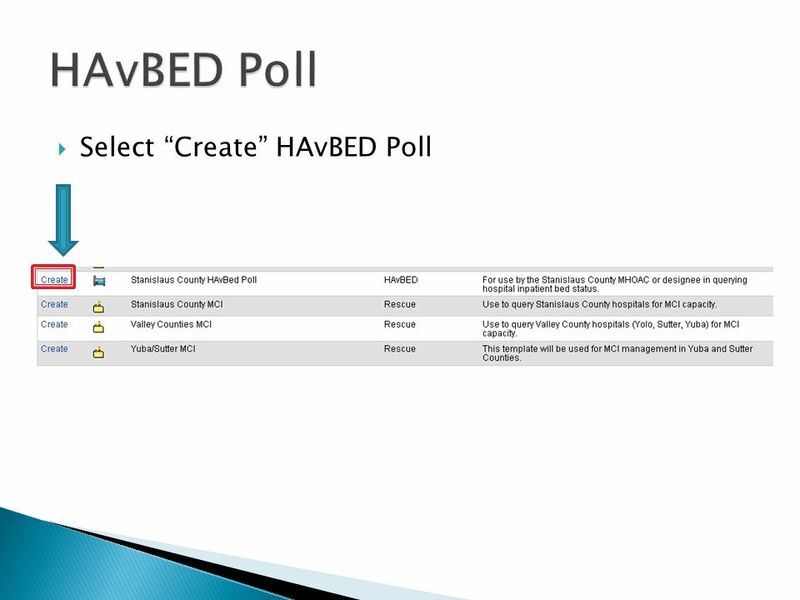 HAvBED Poll).  Click on the “Next” button. A new screen will appear. 40  Choose the resource(s) you would like to include in this report by clicking on the box that is to the left of the resource name. 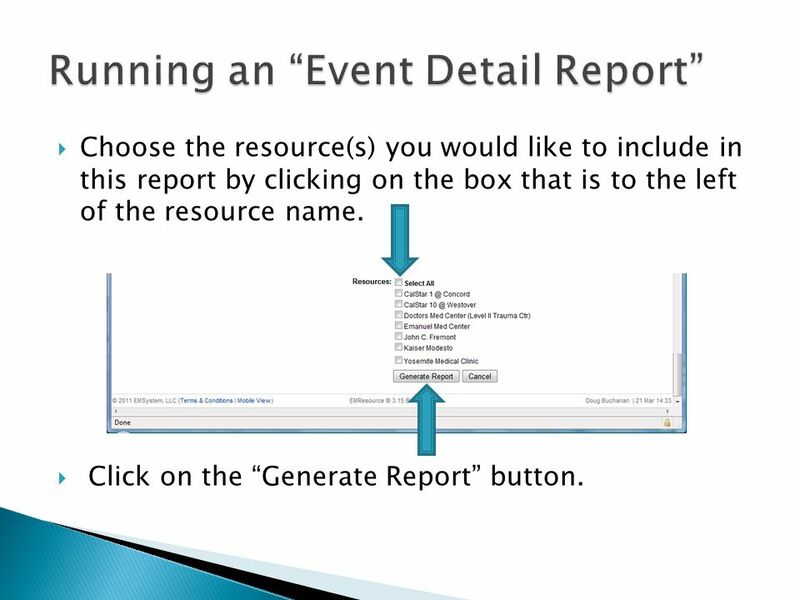  Click on the “Generate Report” button. 41  A new window will open. 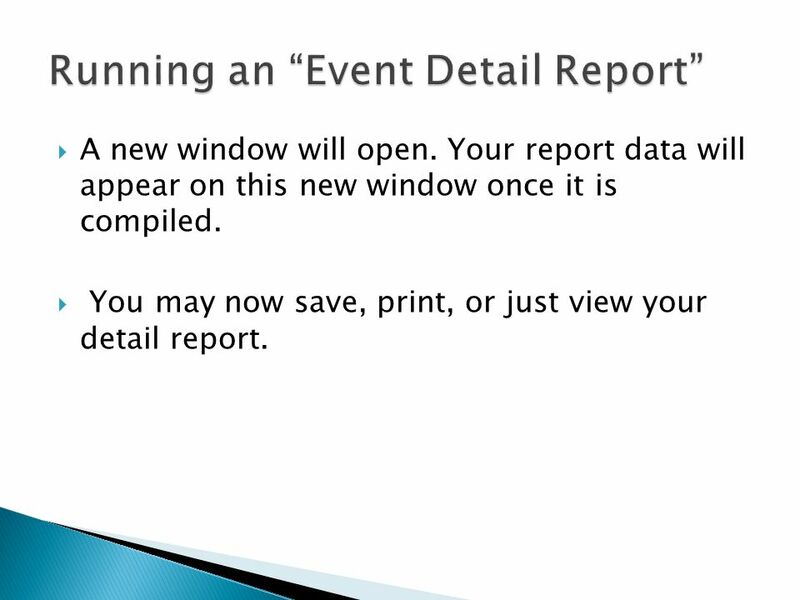 Your report data will appear on this new window once it is compiled.  You may now save, print, or just view your detail report. Download ppt "Revised: March 21, 2011 Click anywhere on the screen to advance." EM Resource Overview Presented by Terry Stagg, HDS, SEM, CHSO. Welcome to CSAW Authorization Management April 2008. ZIMS With Medical Release 2.0 R2 An overview of the Medical Module in ZIMS 1. 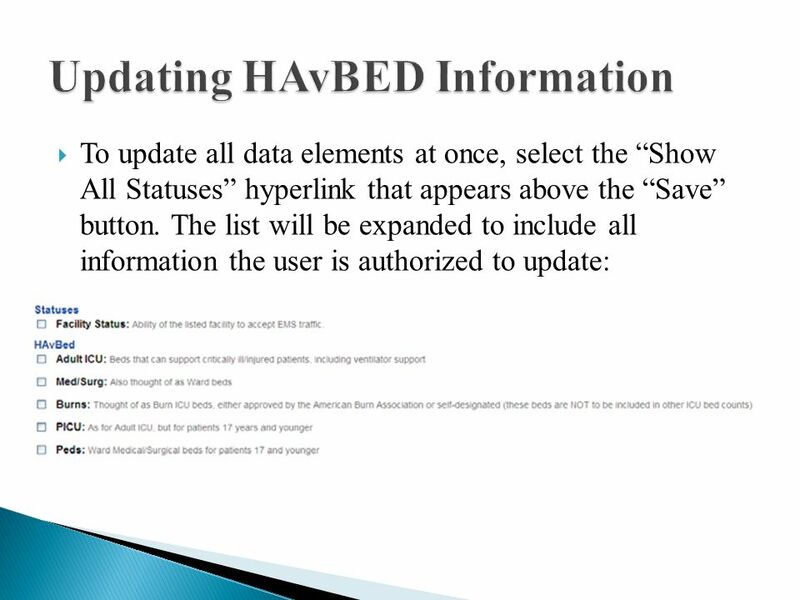 Provincial Hospital Resource System How to update Resource Boards in the PHRS. 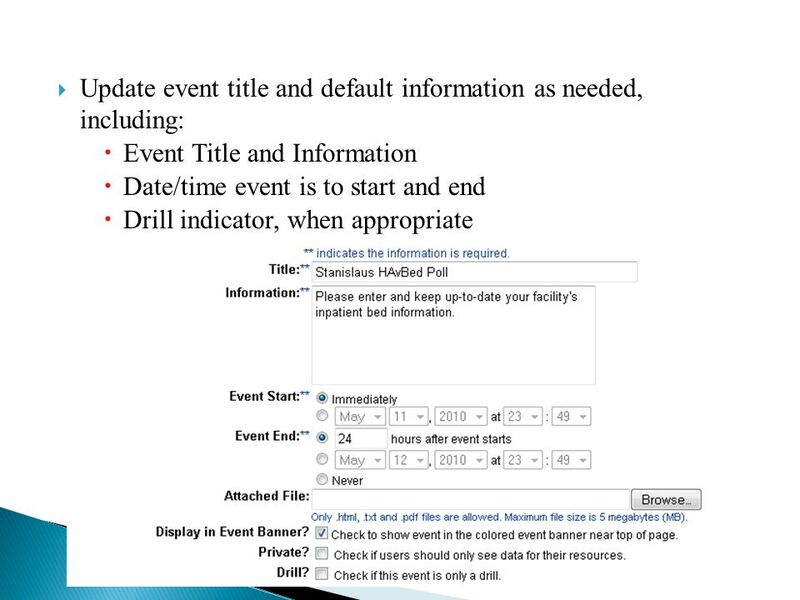 EXCEED® IEP Quick Start Card – Student Record/Events 1.Select the left vertical bar to close the student panel, giving more space for the student record.